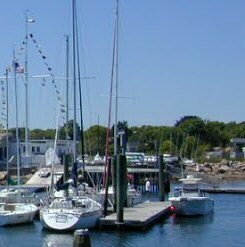 Niantic Bay Yacht Club is a private club, founded in 1940, by residents of Crescent Beach and Black Point, to cultivate sailing and seamanship for members and the community. What started as a small clubhouse with a handful of members has grown to a larger complex that includes a protective breakwater, swimming area, tent, abundant dock-space and a take-out restaurant. Two hundred and fifty families comprise the greater NBYC family—a word that more accurately describes our club. The original goal and focus still is "education of youth and others in general navigation and seamanship." While our motor-boating and fishing members are welcomed, our focus has always been sailing. This relatively small club has "birthed" some of the finest sailors in the world including the current and back-to-back U.S. Women's Match Racing Champion and a two-time J24 and inaugural J70 World Champion. Our club has provided talented collegiate sailors at Dartmouth, Boston University, Yale and University of Vermont. And our Director of the Niantic Bay Sailing Academy, who coaches at Yale, was voted coach-of-the-year on the collegiate circuit. Every (summer) weekend the club runs races for Atlantics, Lightnings, Ensigns and Lasers. Every Wednesday night there is a no-spinnaker race for PHRF and one-design fleets. Our PHRF fleet has also experienced great success winning many Off-Soundings and ECSA championships. The non-profit Niantic Bay Sailing Academy provides carefully crafted instruction for beginners through racers, and for all ages. Racing may be one focus, what we prize most is our friendly family environment; many are members from cradle-to-grave for shared life experiences on the water. 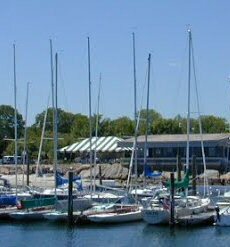 NBYC provides rental slips and moorings for transient boats as vacancies present themselves. NBYC does not have a pump-out station, provide fuel, or have public facilities. 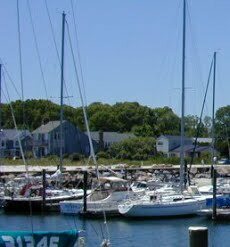 To reserve a slip or mooring, call the NBYC Management at (860) 739-0558. NBYC monitors channel 72. There are a few rock outcroppings and hazards that are well marked by navigational aids. If you hit any of them, let us know so you can be considered for an award. Niantic Bay averages about a 25' depth, and 8' pier-side at the Club. The rise and fall of the tide maxes out at about 3 1/2 '.